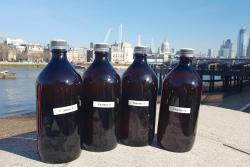 Samples from the river Thames headed for analysis at Bangor University. : Image:Christian DunnNew research by Bangor University and Friends of the Earth has found microplastic pollution in some of Britain’s most iconic and remote rivers and lakes. The study, believed to be the first of its kind, looked at ten sites - including lakes in the Lake District, waterways in the Loch Lomond and Trossachs National Park, a wetland and Welsh reservoir - and found microplastics in all of them. Friends of the Earth and Dr Christian Dunn, of Bangor University (who led the research) say the findings suggest that microplastics should now be considered as an emergent contaminant - and that routine monitoring of all UK waters must now take place. Friends of the Earth is also urging MPs to support new legislation, currently before Parliament, to phase out plastic pollution within 25 years – including an end to non-essential single-use plastic by 2025. 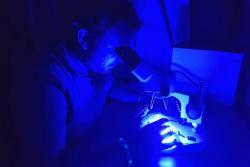 Using a fluorescence lighting system, researchers were able to identify and count microplastic pollutants (less than 5 mm in size) per litre of water, such as plastic fragments, fibres and film. The preliminary findings revealed microplastic pollution levels ranging from over a 1,000 pieces of plastic per litre in the river Tame in Greater Manchester , to 2.4 pieces per litre in Loch Lomond. Using a fluorescence lighting system to identify and count microplastic pollutants: Image:Laura NunnerleyLast year, a report by Eunomia for Friends of the Earth, estimated that huge quantities of microplastic pollution are entering UK waterways from a number of sources every year. The key sources of pollution include car tyres (7,000-19,000 tonnes), clothing (150-2,900 tonnes), plastic pellets used to make plastic items (200-5,900 tonnes) and paints on buildings and road markings (1,400-3,700 tonnes). Friends of the Earth and Dr Christian Dunn say further work is now essential to fully investigate any health risks from microplastics – to humans and ecosystems – so that “safe” levels can be ascertained, and removal and mitigation processes can be put in place. 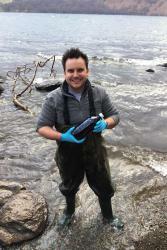 Dr Christian Dunn collecting samples in Ullswater. : image: Carlotta Dunn“It was more than a little startling to discover microplastics were present in even the most remote sites we tested, and quite depressing they were there in some of our country’s most iconic locations. I’m sure Wordsworth would not be happy to discover his beloved Ullswater in the Lake District was polluted with plastic. “These initial findings, from our team at Bangor University with Friends of the Earth, show that we have to start taking the issue of plastic in our inland waters seriously. “Plastic is polluting our rivers, lakes and wetlands in a similar way as pollutants such as so-called ‘emerging contaminants’ like pharmaceutical waste, personal care products and pesticides. “As with all emerging contaminants we don’t yet fully know the dangers they present to wildlife and ecosystems, or even human health, and to what levels they occur in all our water systems. “But it’s now clear that microplastics should be considered a serious emerging contaminant and there needs to be a concerted effort to regularly monitor all our inland waters for them. “The group, from the Bangor Wetlands Group, were instrumental in the method development, sample collection and analysis, and it shows that Masters students at Bangor University really get stuck-in to some cutting-edge research during their studies,” Dr Dunn added. “The widespread contamination of our rivers and lakes with microplastic pollution is a major concern, and people will understandably want to know what impact this could have on their health and environment. “Plastic pollution is everywhere - it’s been found in our rivers, our highest mountains and our deepest oceans. Although there have been a number of studies on plastic pollution in the marine environment and some on the sediment of waterways, less research has been conducted on microplastic pollution in actual water samples from inland systems in the UK. The methodology used in this study offers a simple low-cost way of collecting and analysing samples, allowing regular nationwide monitoring of waterways. If you would like to study and research microplastics in the School of Natural Sciences at Bangor University then visit www.bangor.ac.uk/natural-sciences.